In Germany “Krankenversicherung” (health insurance) is mandatory for all researchers and family members accompanying them. You will need proof that you are insured in order to obtain a residence permit and conclude an employment contract. The policy must at least cover medical treatment in the event of serious illness or accidents. It is advisable to make contact with the insurance provider of your choice before entering Germany so that any problems can be dealt with in advance, and you are covered by insurance from the very first day. It may be worth taking out travel insurance for the first few days in Germany, too. First of all, you should check whether your insurance at home covers medical and hospital costs incurred during your stay in Germany. If this insurance cover is not adequate you will have to take out an additional insurance policy. If your stay in Germany is scheduled to last so long that you are required to become resident in Germany, please note the following: You are required to possess health insurance cover from an insurance provider licensed in Germany if you are not covered by statutory health insurance or entitled to allowances for members of the civil service. For the duration of your stay in Germany your foreign health insurance cover can be switched to the tariff for the qualifying period. There are two kinds of health insurance in Germany: private health insurance and statutory health insurance. Which one you can choose depends on whether you will be working in Germany on the basis of a fellowship or an employment contract. If you stay in Germany privately or funded by a fellowship you have no alternative but to take out private health insurance cover. By contrast to statutory health insurance cover, private health insurance premiums are not incomerelated but dependent on various criteria that infl uence the risk such as age, gender, profession, state of health and the particular kind of health insurance cover you want. The more comprehensive the package, the more expensive it becomes. Private patients receive personal invoices; you must pay them yourself and then submit them to your insurance company for refund. If you are suffering from an illness or condition prior to coming to Germany you should stock up with the necessary medication in your own country because illnesses predating the visit to Germany are not usually covered by the German insurance company, and you would have to pay for any ensuing costs yourself. Pre-natal care and childbirth are also excluded from private health insurance policies if the expectant mother has become pregnant before entering Germany. Study the premiums and benefi ts carefully. If in doubt, speak to your insurance company before you start treatment, particularly if this involves a stay in hospital, to check exactly what costs will be refunded. If you work on the basis of an employment contract then as a matter of principle you are subject to statutory German health insurance. However, where there is a “Sozialversicherungsabkommen” (Social Security Agreement) in place between Germany and your own country the health insurance regulations of that country may continue to be applicable. Your health insurance provider or social security authority at home will confirm this for you by issuing a form headed E 101. On the basis of Form E 101 you will continue to be subject to your national health insurance regulations and not to compulsory German health insurance. As an employed person, if you do not possess Form E 101 then you will be subject to compulsory German health insurance. Your level of income will determine whether you must obtain private or statutory health insurance. Up to a gross salary of 48,600 euro (upper income limit) you must be insured by a statutory health insurance company. If your gross annual salary regularly exceeds 48,600 euro, you are free to choose between a statutory health insurance provider and a private health insurance company. This means that you may opt either for a statutory or for a private health scheme. You must inform your employer which health insurance company you have chosen. It is the employer’s task to register new employees with the health insurance company. The latter then forwards the registration to the other social security providers. The level of contributions to statutory health insurance providers has been standardised. The standard rate is 14.9 % (as of 01.07.2009), of which the employer pays 7% and the employee 7.9%. Contributions for health insurance cover are deducted from your gross salary at source. The benefits of statutory health insurance are, for the most part, also standardised. There are differences in customer service, additional benefits and optional premiums. You are free to choose your statutory health insurance company. A comparison of the different insurance benefits is therefore still worthwhile. If your marital partner or children are accompanying you to Germany it may be possible under certain circumstances to insure them on the same policy at no additional cost (family insurance). In order to benefit from this offer, the family members must be registered in Germany as their main residence. By contrast to private insurance companies, statutory insurance providers pay the costs to the doctor or hospital directly. You merely have to present your insurance card before treatment. Every statutory health insurance provider is required to issue its members with a European Health Insurance Card (EHIC). This facilitates your path to treatment during a temporary visit abroad in Europe. Statutory health insurance users are entitled to medical treatment in case of injury or acute illness in the EU Member States as well as in Iceland, Liechtenstein, Norway and Switzerland. This means you have a right to the treatment that is medically necessary during your stay. You are entitled to the same medical treatment in the host country as the residents of that country themselves. The costs are covered by your statutory health insurance provider and will be paid at the same rate as they would if they had been incurred at home; any excess costs must be paid by you, the patient. We therefore urgently recommend you, whether you are travelling privately or offi cially, always to take your European Health Insurance Card or a provisional insurance certifi cate with you when you travel to countries in the European Economic Area (EEA) or Switzerland. It may be advisable to take out additional, private travel insurance to cover the costs of return transportation and potential price differences between the cost of treatment in the host country and in Germany. The following information applies to citizens of EU States, as well as citizens of Iceland, Liechtenstein, Norway and Switzerland, who are spending time abroad. Health insurance during short visits If you are insured privately or are covered by statutory insurance you may make use of the health services in other EU States, as well as in Iceland, Liechtenstein, Norway and Switzerland, and have the costs reimbursed by your health insurance provider. In cases of out-patient treatment, you can choose whether you wish to be treated in Germany or in another Member State. If you consult a doctor or use other medical services within the European Union you will initially have to pay the costs of the treatment on the spot and then submit the receipts to your insurance provider in your own country. The costs will then be reimbursed at the same level as they would if they had been incurred for treatment at home; any excess costs must be borne by patients themselves. In the case of hospital treatment in another Member State, the agreement of the health insurance scheme must be obtained in advance. This may only be refused if you could obtain the same or equally effective treatment at the same general standard of medical you and your family are only staying in another countryknowledge in good time at a hospital in Germany. Extended health insurance cover comes into force if you are covered by statutory health insurance and on a temporary basis - on holiday or business. In case of illness you are eligible for services that are necessary medically, including hospital treatment. To facilitate treatment during temporary visits abroad, every health insurance scheme is obliged to issue its members with a European Health Insurance Card. In case of illness in another EU country, or in Iceland, Liechtenstein, Norway and Switzerland, medical services are provided according to the laws of the host country and reimbursed according to the charges applying there: by presenting the card, patients are eligible both for services which are free of charge in the host country as well as for free medical treatment. Costs for services which usually incur charges in the host country will be covered by the health insurance scheme on presentation of the insurance card. An extended visit abroad is one that lasts longer than a holiday or business trip or attending a conference, such as a guest professorship or research visit for a semester or a year. If you are staying abroad within the European Union, or in Iceland, Liechtenstein, Norway and Switzerland, instead of the European Health Insurance Card, the following applies: If you are entitled to statutory health insurance at home, then your domestic health insurance provider will issue Form E106 on request. Form E106 entitles you and your family members to register with a German health insurance scheme. The German health insurance scheme will then provide all the services to which a German user would also be entitled. The German health insurance scheme will subsequently invoice your domestic health insurance provider for their costs. 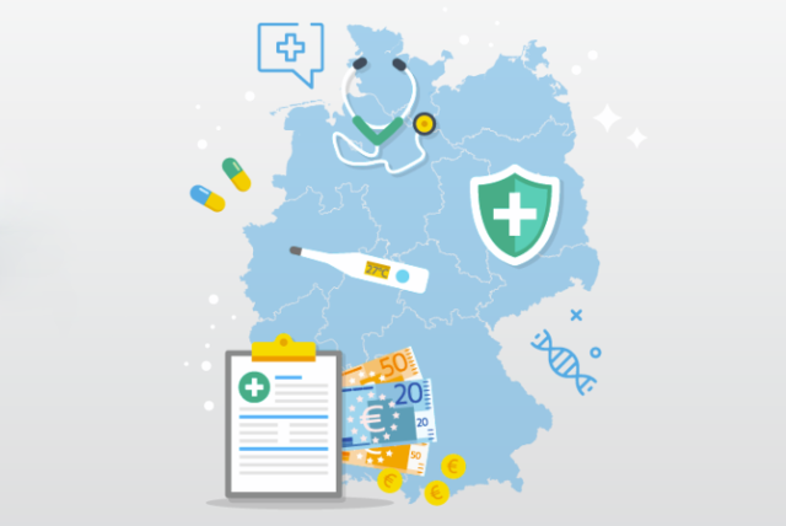 If you are entitled to statutory health insurance in Germany and some members of your family have remained in your own country then the German health insurance provider will issue Form E109 on request. Form E109 allows those members of your family who have stayed at home to make use of the services of the statutory health insurance scheme without having to pay contributions. The domestic health insurance provider will subsequently invoice the German health insurance scheme for their costs.